Sig Sauer P250/P320 Carry Large 9mm/.40/.357 Grip - Black. Please note that the package for these could be marked as P250 but the P250 and P320 use the same grip shell. This is a new OEM Sig Sauer P250/P320 Carry grip shell for 9mm, .40 S&W, and .357 SIG only. This will not work on .45 ACP P250/P320 configurations. 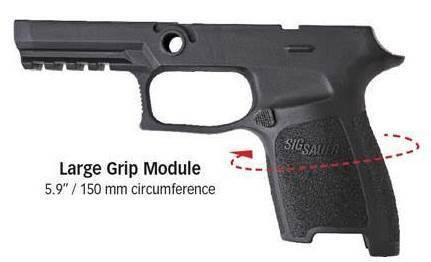 This grip shell can also be used to convert a Compact gun to a Carry gun. The only difference between the two is the taller height grip shell which uses Full Size magazines and keep the shorter barrel.